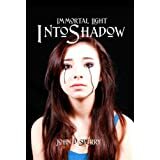 I loved this second book in the Immortal Light Series by John Sperry. It starts off with a bang, placing the reader straight into action, and it never let up until the very last page is turned. I didn’t get a lot of sleep last night because I had to finish the story. Lucy Higgins is forced to grow up fast when her best friend Kat is kidnapped and tortured by evil agents of the Immortal Light. In her quest to find and rescue Kat from their torturous hands, Lucy is separated from her soul mate and forced to put her trust in another man she hardly knows, a warrior named Sean. But can she afford to trust him? Can she afford to trust anyone? It would appear not when at every turn she finds her life and the lives of those she loves placed in mortal danger. In my opinion the first novel in this series would have to be categorized as a straight young adult, with all the teenage angst and confusion that tends to go along with it. I prefer a fast start and admit I struggled some to become engaged with the characters and story. After the first quarter though the action started and I read the rest in one sitting. I have no doubt book two will hold the attention of all readers, YA and adult alike. There wasn’t anything slow, the pace lightning fast, the action intense. The characters are all richly drawn, the tension held high from start to finish. I grew so emotionally connected to Lucy and her struggles that I wanted to jump straight through the pages and try to help her figure out the truth. World building was incredible. I could literally see the swords Lucy and Sean created from water, and light she used as a weapon as they fought against the evil reapers. I have no doubt others will enjoy it as much as I did. I’ll definitely be watching for more from this gifted new author. Posted by Denna Holm on December 23, 2013 in Archives and tagged chilling, fantasy, five star review, Immortal Light, sexual tension, tension level, warriors.